Which activity in "When Will My Life Begin" do te like best? Should Rapunzel let her hair grow longer before she marries? Do te think Rapunzel shouldn't marry Flynn (and marry a prince)? Is Flynn too unaware that Mother Gothel can stab him? Do te think Rapunzel look più like her father o mother? How did Rapunzel's parents recognize Rapunzel? Do te think it hurt Flynn/Eugene when he landed on Maximus when he went to rescue Rapunzelle. How long is the time-gap between "Tangled" and "Tangled Ever After"? Ok I don't wanna go into a fight OK but I have to be honest,Yes I Amore Frozen too its my 10th fav movie of all time but Rapunzel - L'intreccio della torre beats it in my opinion and here is why. 1. Better story-As te know what each charcther is and what they represent and the structure of the story is brilliant and interesting.Frozen's was kinda good but it lacked on the backstory. 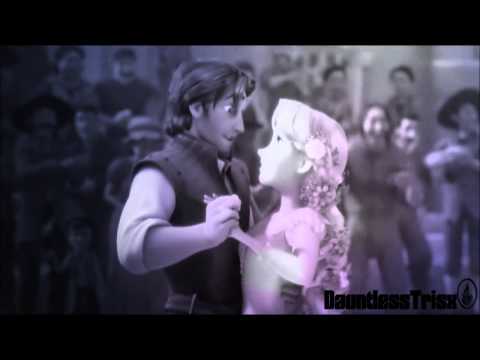 Hi guys this is LisaForde2 here back to fill te in on my obsession that is Tangled. HANDS DOWN this is my ALL time favourite movie ever made and if te don't believe me well im gonna do a lista of things that I have in relation to this film. #3 Rapunzel dolls[one Mattel,one of her as a brunette and the other as a blonde from the Disney Store]. #2 Eugene Dolls[matel one and Disney store one from T.E.A that was with brunette Rapunzel]. Agh! Huh? Uh? [struggles] Is this hair? I know why you’re here, and I’m not afraid of you. Uh, uh… Agh! Oh no. No no no no no no no no no no, this is bad, this is very, very bad, this is really bad… They just can’t get my nose right! So, mother, earlier I was saying tomorrow’s a pretty big giorno and te didn’t really respond, so I’m just gonna tell you, it’s my birthday! Uh. Tada! Gotcha! That's twenty-two for me. How about twenty three out of forty five? This is the story of how I died. Don't worry, this is actually a very fun story and the truth is, it isn't even mine. Now, once upon a time, a single drop of sunlight fell from the heavens and from this small drop of sun, grew a magic, golden flower. It had the ability to heal the sick and injured. Oh, te see that old woman over there? te might want to remember her. She's kind of important. Do te notice? Some of the scenes in the movie Rapunzel - L'intreccio della torre are actually similar to the scenes in other Disney movies! Perhaps it is because the animators who created it also created the other Disney movies. Remember the similarities between Snow White's dwarf party dance and Maid Marian's forest party dance? o Aurora's last dance and Belle's ballroom dance? Here are 12 similarities between Rapunzel - L'intreccio della torre and other Disney movies. Thumbs up if this is your favourite animated movie of 2011 cause it is for me. What’s not to like about this movie I laughed so hard(Rapunzel whacking Eugene over the head with a frying pan, Eugene recitazione all cocky yet deep down his a good guy with a good heart),and I even cried like a baby(if te saw the movie te know what im on about). So here is what I have learned from watching Tangled. #1 A bad guy can turn out to be good. #2 Never trust anyone who is after your magic powers. Some immagini for the brilliant movie. a comment was made to the poll: Are Rapunzel and Flynn your preferito Disney couple? a comment was made to the poll: Do te think "I See The Light" deserves to win Academy Award più than Toy Story 3's "We Belong Together" does? a comment was made to the poll: Should Rapunzel let her hair grow longer before she marries? What was the movie originally called?